Scoliosis is a deformity in the spine that causes an abnormal C-shaped (one curve) or S-shaped curvature (two curves). 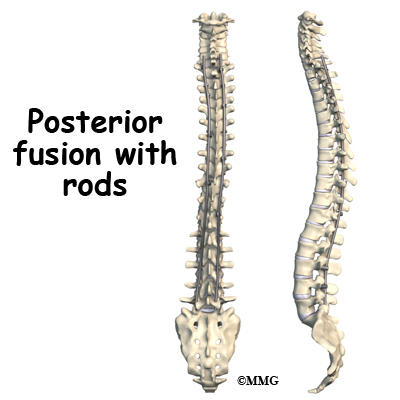 The spine is not straight but curves to one or both sides. There are three types of scoliosis depending on when it develops. Infantile occurs from birth to three years of age. Juvenile scoliosis develops between four and nine years of age. Adolescent presents between 10 years and when growth is complete. Adults can have residuals of childhood scoliosis. The human spine is made up of 24 spinal bones, called vertebrae. Vertebrae are stacked on top of one another to create the spinal column. The spinal column is the body’s main upright support. 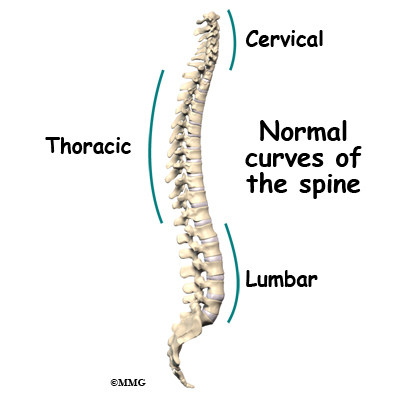 When viewed from the side, the spine forms three curves. The neck, called the cervical spine, curves slightly inward. The thoracic spine curves outward. The low back, also called the lumbar spine, curves slightly inward. When viewed from the back, the vertebrae form a straight column keeping the head centered over the body. Each vertebra is made of the same parts. The main section of each vertebra is formed by a round block of bone, called the vertebral body. 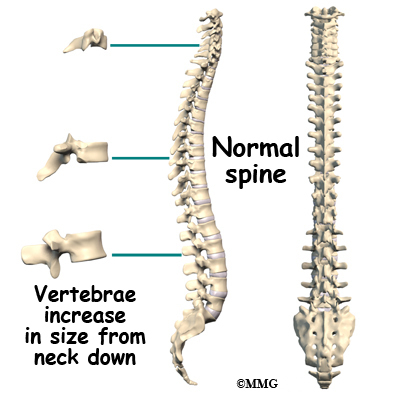 Each vertebra increases slightly in size from the neck down. The increased size helps balance and support the larger muscles that connect to the lower parts of the spine. A specific cause of scoliosis is unknown or idiopathic. Idiopathic scoliosis is the most common type and affects about two to three per cent of the population. It tends to run in families and is more common in girls than in boys. Most often it develops in middle or late childhood during a rapid growth spurt. The condition can also be congenital (present at birth) or it may develop as a result of another neurological condition such as cerebral palsy, spina bifida, or spinal muscular atrophy. Any part of the spine can be affected by scoliosis including the cervical, thoracic, or lumbar vertebrae. Most often the thoracic and lumbar spine are affected. 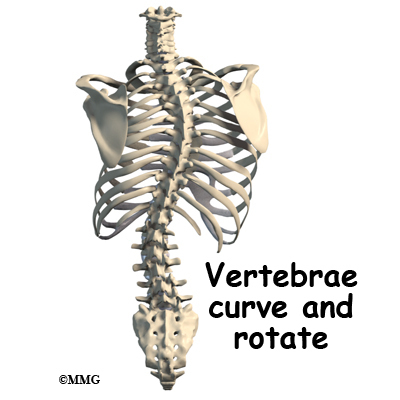 The vertebrae curve to one side and may rotate, which makes the waist, hips, or shoulders appear uneven. 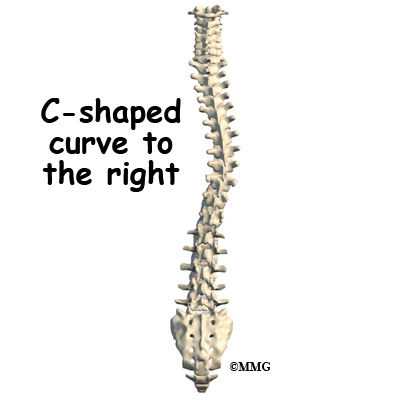 At first, a C-shaped curve may develop causing the shoulders and hips to tilt down on one side. 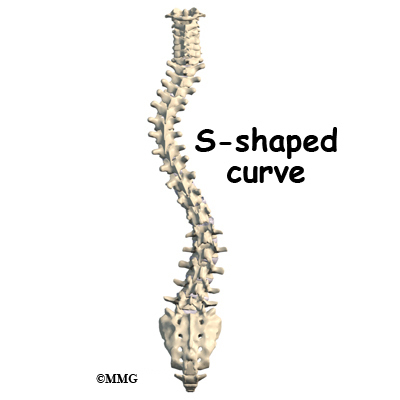 In an effort to keep the head in the middle, the spine may compensate by curving the lower part of the spine in the other direction, forming an S-curve. The most common curve in infantile idiopathic scoliosis is in the low thoracic region. Single curves are almost always in the thoracic region with variable amounts of vertebral rotation. As the vertebrae rotate, the attached ribs shift causing a noticeable rib bump or hump on one side of the spine. Most of the curves (85 per cent) are to the right when they occur after the age of two years. The curve doesn’t always attempt to correct but when it does, a double (S-shaped) curve develops. Infantile idiopathic scoliosis with the thoracic curve to the left occurs most often in boys observed before one year of age. This type of scoliosis tends to resolve on its own without treatment. It does not get worse with puberty during growth spurts. Juvenile idiopathic scoliosis develops in boys at an earlier age than in girls. Boys also mature skeletally at a later age. This means there is a greater risk of curve progression in boys with this type of scoliosis compared to girls. The typical curve patterns of juvenile and adolescent idiopathic scoliosis are similar with right thoracic and double major curves present most often. Scoliosis is a painless condition. You may not feel any change in the spine but instead notice that your clothes don’t fit quite right. As the spine starts to curve, the body adjusts to keep the head in the middle over the pelvis. As a result, the shoulders and hips may be uneven, causing one shirtsleeve or pant leg to seem shorter than the other. 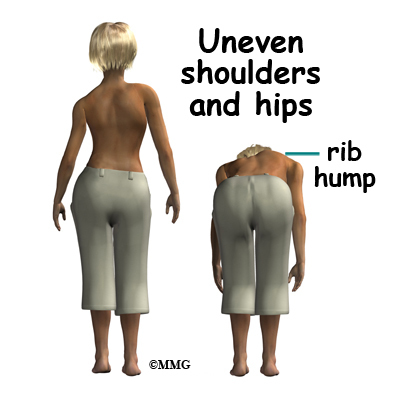 Often there is rotation of the vertebrae causing an uneven waist so that a pair of pants or skirt twists to one side. The presence of one or more of these signs suggests a need for a medical exam by your pediatrician, primary care physician, or orthopedic surgeon. Severe scoliosis can cause pressure on the heart, lungs, liver, and other internal organs. Early diagnosis and treatment are important to prevent problems with breathing and cardiovascular function. Many children are examined during a school screening program by the school nurse or physical therapist. The Adams forward bend test is used to look for prominence of the ribs or changes in the spine. From a standing position, the child slowly bends forward at the waist as if diving into a pool. Anyone with signs of scoliosis is referred to his or her family doctor. Your doctor will examine the spine and look for any possible causes of scoliosis. X-rays may be taken to look for any tilt or rotation of the vertebrae causing a curvature. X-rays are not immediately ordered for everyone in order to avoid needless exposure of growing children to radiation. Signs of asymmetry (unevenness) and other changes observed with scoliosis during the exam usually result in x-rays being taken. An MRI may be ordered if the physician suspects an infection, tumor, or problems in the nervous system. When an x-ray is warranted, your doctor will use a technique called the Cobb method to measure the location and degree of each curve. Curves must be more than 10-degrees to be considered scoliotic. X-rays are also used to identify skeletal maturation or bone growth. The Risser sign is applied to the x-rays of the pelvic bone to judge whether or not the child has stopped growing. The amount of spinal curvature is compared with the stage of growth activity to help guide treatment. There are several ways to treat scoliosis in children: do nothing (observation), exercise, bracing, and surgery. Studies show that 90 per cent of infantile scoliosis resolve or go away on their own. In such cases, we say the child will grow out of it. The optimal treatment depends on the degree or severity of the scoliosis. Examination and x-rays taken over a period of time will help show if the scoliosis is staying the same or progressing (getting worse). Curves 45 degrees or less are more likely to be treated conservatively with exercises or bracing. Curves that are changing rapidly or greater than 45 degrees may require surgery. Selecting treatment options for the child with scoliosis involves several factors; the age of the child, the degree of the spinal curve, the skeletal maturity of the spine, and the preferences of the patient and family. Treatment may be nothing more than observation especially if the curve is 30-degrees or less in a child who is no longer growing. If the curve is progressing and the child is growing rapidly, or if the curve is 30-degrees or more, the child is referred to an orthopedic surgeon for exercise and/or bracing. For many years,exercise was not considered effective in stopping or changing spinal curvatures from scoliosis. But recently, researchers have taken a closer look at exercise. They found that in previous studies, most of the children didn’t do the exercises. Or if they did, they only did them occasionally. Unless the exercise program was designed to prepare for a sports activity, compliance was very low. Improved technology and the ability to assess muscle function have changed the picture. We now know that there is asymmetry in muscle function for everyone with scoliosis. More specifically, there is an uneven strength in trunk rotation. The former exercise programs of stretching and general strengthening may have been the wrong approach. Studies using exercise equipment that can measure muscle function show that progressive resistive exercises (PREs) are effective for curves less than 45 degrees. The best bracing results occur in children with slowly progressing curvatures that are detected and treated early. A major thoracic curve before the age of five is more likely to result in other complications. Bracing is less likely to stop curves larger than 40-degrees. Bracing is more effective for single curves in the thoracic spine than for double curves. Most braces are worn over a tightly fitting cotton T-shirt but under the clothes. While you wear the brace, physical activity is restricted. Two braces used most often for this condition are the Milwaukee brace and the Boston brace. 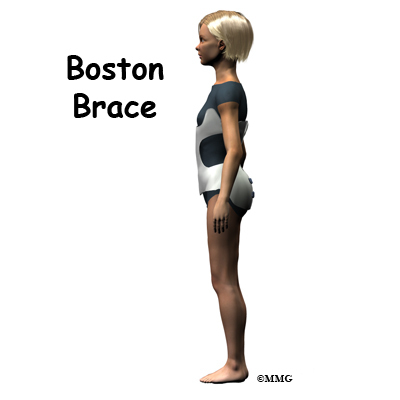 The Boston brace is also called a thoracolumbosacral-orthosis or TLSO. Studies show that bracing controls the curve and prevents progression. In most cases, bracing does not correct the curve; it just keeps it from getting worse. 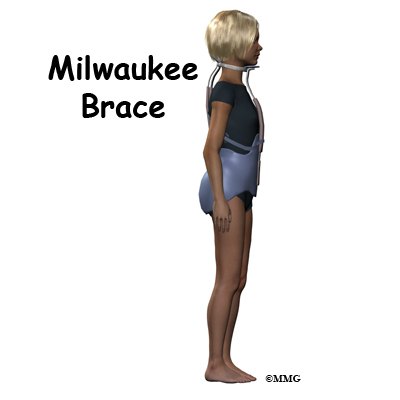 The Milwaukee Brace is a corrective brace used with children and adolescents who have scoliosis. It has a pelvic girdle, two posterior uprights, one anterior upright, and a ring around the base of the skull that also supports the lower jaw. Originally made of leather and metal, it has been revised now and is constructed out of rigid plastic with metal uprights. Pads with straps attached to the frame are used to apply corrective forces. The Boston Brace used for the treatment of scoliosis is very similar to the Milwaukee orthosis. The Boston brace does not extend up as high into the thoracic spine. It does not have the vertical bar in front of the chest or the cervical ring. The Boston brace works best for children who have immature spines or moderate scoliotic curves in the lower thoracic and upper lumbar spines. If bracing doesn’t stop the progression of scoliosis, then surgery may be needed. Metal rods or screws are used to help straighten and hold the spine in a corrected position. The vertebra are fused (joined together) to help correct the curvature. Only a small number of people with scoliosis require surgical intervention. New surgical techniques are designed to give maximum correction with a minimum of incisions and scarring. Surgery for idiopathic scoliosis is generally suggested when the curve is 50 degrees or more and bracing fails. Surgery is recommended with two goals in mind; 1) prevent progression of the spine deformity, and 2) to lessen the existing spine deformity. The surgical procedure most often used to correct idiopathic adolescent scoliosis is a posterior (through the back) fusion with instrumentation (rods, hooks, screws and wires) and bone grafting. Sometimes if the curve is severe, additional surgery may be required through the front of the body. Scoliosis surgery is one of the most complicated orthopedic surgical procedures performed on children. The operation will take several hours. Exercises to improve trunk rotation strength must be done on the correct equipment. It is important to use equipment that can isolate and strengthen torso rotation. The exercise will equalize strength from one side to the other. You will probably start at one-fourth your body weight. Resistance can be increased five per cent when you can do 20 repetitions in each direction. A physical therapist will help you set up this program. It should be done twice a week until the curve stabilizes. Some adults find this exercise program helpful in controlling pain. While in your brace, you won’t be able to participate in sports that require flexibility such as gymnastics or tumbling. Physical contact sports such as football, hockey, or soccer are also prohibited while wearing the brace. Some children are allowed to remove the brace for two to three hours each day and participate in sports with their physician’s approval during that time. Bracing is generally used for at least two years or until there is no sign of further change. Your surgeon will follow you at regular intervals. Follow-up visits and repeated x-rays are needed more often for the child who has a rapidly progressing curve or who is in a growth spurt. Post-operative patients are usually discharged from hospital within five to seven days. They are able to progress quickly, returning to routine daily activities, including returning to school. Your surgeon will discuss your activity restrictions.